We have 2 giveaways up and running! The first is for a chance to win 1 of 5 of the excellent Veiik Airo Pod kits and the second to win some tasty e-liquids. Be sure to follow on social media for all new giveaways! You can also hear about all our new giveaways, latest reviews, deals and news by subscribing to our email list (Click Here) to sign up, don’t miss out on future events! Want to run a giveaway on Ecigclick? Get in touch with us via this contact form to discuss how your brand can be featured on this page and get in front of thousands of vapers! Thanks Deby, glad all was received OK. It shows to come to this page for the innokin vape giveaway but there’s nothing on the page here about it… kinda confused? help? It’s right up there on desktop/laptop. If on mobile there may be a caching issue. It should resolve iteself in a short while so please try again soon! Merci pour cette chance et merci pour cette générosité. Joyeux Noël. Can take approx 3-4 weeks as it’s being shipped directly from Smok, China. If there is no sign by the 4 week mark please email me on the address you have already contacted on. I won, how to claim the prize? Please send us an email via the contact form! Won a Vandy vape simple kit 5 weeks ago,i was contacted by Jonny himself to get my full details answered the same day, was fast to answer and very polite, 5 weeks after still nothing delivered and surprise Jonny does not answer me anymore neither by email, facebook or twitter,if no news this week i will consider going further. this is not serious or fair, a win is a win no matter where it come from. Sebastian, the emails you refer to that I didn’t respond to were sent Friday night, Saturday and Sunday. Today is Monday. Did you take into consideration that I may not be around to answer at the weekend? Not sure what that you mean by going ‘further’ but I guess it relates to you accusing me of running a fake giveaway in your last email. I have worked with over 30 brands and vape businesses over the past 8 years running vape giveaways and successfully delivered winning prizes to over 120 happy vapers, probably more. Is 5 weeks a long time to wait? Yeah I’m not denying that and waiting for free vape gear can be annoying. I am more than happy to work with you to chase up your free prize but be real, have patience and cut out all that threatening BS. There is a way of going about things. You will receive it even if it’s a little later than you expect. I can confirm it’s not fake, I’ve won two prizes in two separate giveaways and received both, admittedly the one from China took some time, but I definitely received it. Wow, I just won one of the competition and I am buzzing, I can’t wait for my prize to arrive. I would be grateful to win anything at all! They are all amazing prizes! 2 reasons I cant afford or buy any new vape gear 1 I had a house fire 2 months ago with my 2 kids and fiance and we lost everything so all money goes to rebuilding from scratch and 2 I was recently diagnosed with chrones disease and medical bills are very costly! So a chance like this is very appreciated. And to win something to help quit stinkies is a blessing if I do win thank you again! Hopefully I win. Good luck everyone! Jacvapour Series S-22 cool set! Nice giveaway! Awesome prizes ! Thanks for the giveaway! Thanks for the chance!! I’d like to win the JacVapour DNA75 Sandstorm Edition Mod! I’d love to try a DNA mod and this one is very sleek and well built! Best one! Jacvapour Series B DNA75 Sandstorm Edition! I would love to win the Jacvapour Series B DNA75 Sandstorm Edition. Love the size. Awesome giveaways, thanks to everyone involved! Thanks for the amazing opportunity, even if I don’t win. Good luck all and fingers crossed !! I would be happy with anything! Keep spreading the word !! Love to win anything really. Dont win alot ever in my life so im not picky lol!! This would be fantastic to win! Good luck everyone! If I win, I would like the Jacvapour DNA75 Sandstorm Edition the most of all products available. I would love to win a Vaptio P 111, like the small size & built in battery. Thanks for the great contests !! Jacvapour DNA75 Sandstorm Edition mod with batteries and a ton of juice, wow what a christmas present that would be. I’d choose Jacvapour DNA75 because it would suit my needs perfectly. A dna75 sandstorm looks sweet! I’ve been thinking of getting into squonking, but I’d be thankful for any of these! Thanks so much! DEFINITELY the Jacvapour DNA75 Sandstorm Edition!!! Thanks for the awesome giveaways!! Good luck &happy holidays to everyone!! I’d be ecstatic winning anything,lol. But the sandstorm would be an amazing Xmas gift!! I would like 2 win DNA75 Sandstorm edition. Id love the dna75 sandstorm. Thank you for your generosity and the opportunity. Jacvapour DNA75 Sandstorm Edition looks great! I would live to win the DNA75 Sandstorm mod! I would love any of it, Vale on and be happy. The Jacvapour DNA75 Sandstorm Edition is the best for me. I would like the Jacvapour DNA75 Sandstorm Edition mod. I would like the Jacvpaour S17 TF kit. It seems like a good outdoor vape. I would like to win anything as long as it is regulated not mech. I’d like to win the DNA75 Sandstorm. I haven’t owned a DNA device yet, Thank You for the chance..
Jacvapour DNA75, always need another dna75 device. The Jacvapour S22 kit looks great! Jacvapour DNA75 Sandstorm Edition mod! I like the DNA kit. I would love to win the DNA7 Sandstorm kit looks awesome! For me it would have to the S22 Kit as it looks amazing thanks for the chance. The DNA version would be great, but they all look like good kits to start with. The DNA75 because I like these types of mods. I’d like to try the Jacvapour S22 kit….i’m not a beginner but i’m no way an expert yet either! I would really love to wint the Jacvapour DNA75 Sandstorm Edition. I need a high-end mod. Jacvapour DNA75 Sandstorm is what I’m liking. 1x Jacvapour DNA75 Sandstorm Edition mod + Battery + 3 X Packs of Bryn’s Special Sauce. Thank you! I would LOVE the Jacvapour DNA75 Sandstorm Edition mod + Battery + 3 X Packs of Bryn’s Special Sauce please! It will be the perfect Xmas present for my missus, who is trying but failing to give up the stinkies! Jacvapour DNA75 please and thank you. Id be honoured to win the Jacvapour DNA 75 Sandstorm edition. The Jacvapour DNA75 Sandstorm Edition mod would be amazing! DNA75 Sandstorm Edition mod + Battery + 3 X Packs of Bryn’s Special Sauce for me please. Jacvapour DNA75 Sandstorm Edition mod. Thanks for the chance! Thanks for giveaway! DNA 75 for me please! DNA 75 for me please! I really want to win the Jacvapour DNA75 Sandstorm Edition mod. Jacvapour DNA75 Sandstorm Edition mod + Battery + 3 X Packs of Bryn’s Special Sauce. Yes the DNA75 watt Sandstrom would be awesome. I would like to win the JacVapour DNA75w Sandstorm Edition. Jacvapour DNA75 Sandstorm Edition mod looks great! Very beautiful and interesting device! Tasty and powerful! THe Vaptio P-III because of the built in battery and the small size! I would love to win N1 PRO 240W KIT because I need something better and stronger and this mod seems to be up to the task. Plus I like the way it looks and the features it offers (color display being one of them). Vaptio P-III KIT because I like box mods with built-in batteries and because I really like the design. Any of them would be great – but I would really love the P-III kit. I think it’s an Awesome Giveaway, Thanks for the chance. I would like to win the N1 Pro 240 nice capable Device much appreciated. Would love to try the n1 pro or even the v flat. Pretty please? The N1 Pro or the PIII both look like amazing mods that anyone would be lucky to own! I would like to win the Vaptio P-III Kit because of the looks, small size, and built in battery. Thanks for the chance. That N1 PRO 240W KIT/200W KIT is looking pretty sharp. I wouldn’t mind finding my name on that. I like the N1 Pro 240, it’s small but powerful. Thanks for the chance! I would like to win Vaptio N1 PRO 240W KIT. Looks really cool! Would love to win the Vaptio N1 Pro, thanks. I would love to win the Vaptio N1 PRO 240W KIT.. Thank You for the chance. I would love to win the Vaptio N1 Pro 240w Kit! Looks cool and great specs! I’m not picky I’d be happy with anything. Honestly, I would like to win any of these. I haven’t had new vape gear for at least a year and a half. The one mod I use has been dropped so many times, I’m surprised it still works. Well, “works” maybe isn’t the correct word haha. Good luck, everyone! And thank you for the ones who provided the goods for the giveaway and put it on for all of us! Any of them would be amazing! I would love to win the Vaptio P-III KIT. Great giveaway, I’d like to win the Vapito N1 Pro 240w kit. Vaptio P-III KIT for me! I would like to win the Vaptio P-III KIT because its simpler and just what I need. I would love to win the soon to be released DotMod Squank Mod! I would like to win Vaptio N1 Pro 240W. Lot of power and excelent autonomy. Wow this Vaptio N1 PRO 240W KIT i so awesome and I win this game this kit is for me! Great giveaway!!! I would love to win the N1 Pro 240W Kit! That N1 pro is right up my ally…thanks for the awesome giveaway!! I would love the Tesla Invader, but any prize would be amazing! Amazing Anniversary celebration! I would want GTRS GT150 Mod becouse is very suitable for my needs, but I wouldn’t by angry to win whatever you give me! Thank you very much! I’d love to win any of these amazing prizes. Thanks for the chance! Got my winning eye on that little GTRS fella, looks like a solid compact on the go banger. Heard great things about the Serpent SMM too. Thanks for the chance(s) mates, good luck to everyone and keep offa them stinkies! I would like any of them but would rather have either of the mods more then the tank. Fingers crossed for the Tesla Invader or the GTRS GT150, but I’d be stoked to win any of it! Tesla Invader 2/3 VV MOD is my favorite ! Would love to win any of the items, they look like great bits of kit! I hope win GTRS GT150 Mod because I love small mods with built-in battery and which have unordinary design. thanks for the awesome giveaway! I’d love to win the serpent rta or tesla invader! The Tesla Invader looks great! I’d go for the RTA , never owned one . I have been vaping for a short time (less then a year) but I think it is time for an upgrade. I would love the 2 X GTRS GT150 Mod. I would love to win the Tesla Invader 2/3 mod, because I love my other Tesla mods.. Thank You for the chance..
Love that GTRS GT150 TC mod. Small and powerful. The mod is wonderful.It would be a gift for a wife. that’s a tough choice but I think id like to have the wotofo serpent smm rta because of the 4ml capacity, single coil build and looks very easy to build on. I would like to win the Wotofo Serpent SMM RTA as I love rta’s I have been using rdtas but like the designs of rtas. 2 months smoke free. New to vaping. Looking to experiment with new gear. I’d go for the WOTOFO Serpent SMM RTA. Been enjoying doing my own builds. However another mod would be ok too. Thanks to both of you. I would hope to win either the Wotofo Serpent SMM tank or the Tesla mod. My fingers are crossed. eCigclick has some awesome giveaways! Thnx 4 da opportunity ? thanks guys cool giveaway, gl every one. hope i win lol? nice one! thanks a lot!!! What an awesome opportunity and Amazing giveaway!! I really hope to win this!!! Thank You ECIGCLICK,!!! This tank looks like a really nice one! I REALLY hope to win this giveaway!! Thank you very much for the opportunity! Thanks for the opportunity to win a vaporresso. Very nice giveaway.thanks. Thank You for the chance to win this awesome Estoc Mega Tank By Vaporesso! Very nice tank and awesome chance to win one. Thx for the MEGA Cool Giveaway !! !Heaven Gifts you are great Thanks!!! 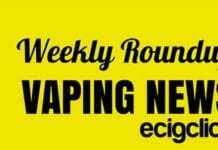 Always great for a chance to bag something new and check new sources for vape info! Thank you for giving us the opportunity to win vape gear. I love it and I follow. Thx for the MEGA Giveaways Thank you!!! VAPE ON!!! Awesome giveaway!! I love Heaven Gifts!! Always my go to online store! !